I Have a lot of Oral Health Concerns – Can I Get Dental Implants? Patients with healthy smiles are not usually the ones who need to replace missing teeth. If you’re struggling with a number of oral health concerns that lead to the loss of one or more teeth, you need to replace this lost tooth structure to ensure optimal oral health and function. Often, the best tooth replacement option is to use dental implants to support replacement teeth. Patients with poor oral health may not be the ideal candidates for this tooth replacement option, but thanks to advances in implant placement materials and methods, we can work with patients to improve oral health and replace missing teeth with dental implants. Take a look at your smile in the mirror. You can’t see your back teeth, so they may not seem that important. Now, take a bite of something chewy. Suddenly, the fact that your back teeth are out of sight doesn’t mean they’re out of mind. Even if you can’t see your back teeth, they are important in maintaining your smile’s healthy function. 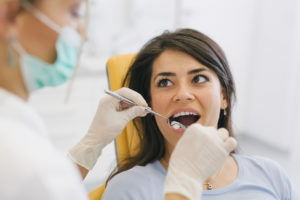 Many patients who lose one or more back teeth think they don’t need to replace them because they can’t be seen, but replacing any missing tooth is essential to keep your smile whole and healthy. Dental implants, fixed bridges, and dentures are all tooth replacement options to repair your smile following tooth loss.